During the meeting the President made a statement concerning Russia’s accession to the World Trade Organisation (WTO). Russia can refuse to fulfill its obligations to the WTO, Vladimir Putin said. The only country with which Russia has not been able to reach an agreement about accession to the WTO is the United States, the President reminded. Vladimir Putin remarked that if for one reason or another they are not able to reach an agreement then Moscow will no longer abide by the rules contained in the agreements that Russia has both accepted and executed, even though it is not yet a member of the WTO. Vladimir Putin added that in many ways the Russian economy is more liberal and open then that of many countries who have been members of the WTO for a long time. 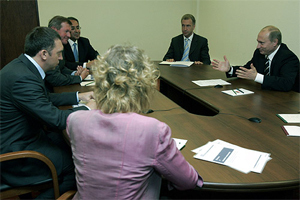 When answering the questions of the chairman of the International Chamber of Commerce, Marcus Wallenberg, about the measures that Russia has taken to prevent the infringement of intellectual property rights Vladimir Putin said, in particular, that at the national level Russia has adopted a number of laws to protect intellectual property. The crux of the matter is that they must all be implemented properly within the country. Along with this, problems in the sphere of intellectual property affect not only Russia but other countries as well, first and foremost countries with developing economies. These problems will be examined at the G8 summit in St Petersburg. When commenting on Marcus Wallenberg’s statement at the Doha round of negotiations on WTO accession, Vladimir Putin pointed out that Russia does not subsidize exports of its agricultural products. There are no subsidies for agricultural production in Russia and the fact that other countries subsidize their agricultural sector prevents economic inequality from decreasing, especially in developing countries. Vladimir Putin also mentioned the discussion of ensuring the security of nuclear power stations that will take place at the forthcoming G8 summit.